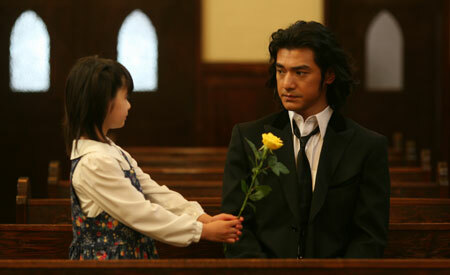 Death meets life: Takeshi Kaneshiro gets a gift in Accuracy of Death. A familiar premise and standard sentiments make Accuracy of Death inherently affecting but also a bit contrived. Still, the whole is lifted thanks to a fun, winning star turn from Takeshi Kaneshiro. Enjoyable, if not essential. by Kozo: When it comes to playing clueless, lovable innocents, Takeshi Kaneshiro is a master. Since he was a fresh-faced young-un, Kaneshiro has excelled at charismatic puppy-dog characters, his appearances in films like Chungking Express and Lost and Found making him an icon of quirky, innocent and lovelorn youth. Kaneshiro has since aged (he's now 35), and now seems to essay haunted or brooding characters more than the lovable dreamers he made his name on. However, the actor still has the ability to effortlessly charm, and sometimes via acting that would be regarded as overdone or labored if employed by other performers. Case in point: the fantasy-drama Accuracy of Death. Were it not for Kaneshiro's likable screen presence, the film would probably have a hard time transcending its underdeveloped details, unremarkable themes and familiar sentimentality. Kaneshiro's natural, innate screen charm makes the film more than the unnecessary been-there-done-that movie it could have been, and turns it into, well, an enjoyable been-there-done-that movie. Based on a popular novel by Kotaro Isaka, Accuracy of Death tells the story of a death god (or shinigami) who becomes a little less godlike thanks to three particular encounters with humans. Kaneshiro is Chiba, an immortal and supernatural being whose work requires him to show up seven days prior to an unnatural death (meaning a death not caused by sickness, age, or suicide) to judge whether or not to stay the person's demise. During that seven days, he shadows the potential deceased, and eventually gives his thumbs up or down on their life. Occasionally he bumps into other shinigami who are also doing similar jobs, leading to impromptu shinigami meet-ups where they talk shop and swap stories. Shiba's liason to his heavenly offices is a black dog that communicates silently via onscreen text (Telepathy, maybe? ), and sometimes acts as Chiba's sounding board. Most of the time, however, the dog just stands around looking silent and adorable. Chiba is pretty reserved for a death god, and doesn't romance his assignments or get involved with them like some of his colleagues. Still, he seems to yearn for more, lamenting early on that he's never seen a blue sky. Indeed, it rains whenever he appears on Earth to do his work, to which Chiba usually sighs passively. It's through three cases that Chiba ultimately conquers his rainy days and finds some semblance of life. The first case involves introverted customer service representative Kazue Fujiki (the beautiful, doll-like Manami Konishi), who's suffering from a lingering sadness, and may be threatened by a phone stalker. He accidentally comes into personal contact with her, and their interaction hints at romance. The second case takes place a couple of decades later, and involves a veteran Yakuza (Ken Mitsuishi) who may be double-crossed by one of his own men. Jumping forward a few decades later, Chiba meets an elderly hairdresser (Sumiko Fuji), whose death is also supposed to be unnatural, though the film doesn't give us a clue as to why. However, the woman seems to be expecting her death, and instead asks Chiba - who she mysteriously knows to be a shinigami - for a last wish. Accuracy of Death tells three smaller stories and one large one. The smaller ones involve the individuals facing their deaths, and explores whether or not they'll escape their prescribed fates. Nothing really exceptional happens there, and the stories only take on meaning when attached to the larger story, which focuses on Chiba. It's through Chiba's interactions with the potential dead that the audience learns about his world and his job, and allows him to develop ever-so-slightly as a character. The progression of each story offers some minor surprises and plot twists - none of which are surprising if you're paying actual attention to the film - and the second story is less interesting for its actual plot than for the minor revelation of how Chiba goes about his business. It's only in the third story that everything comes full circle in a predictable, but still pleasant and affecting manner. Along the way, the film also introduces numerous plot holes and details that challenge suspension of disbelief. If one wanted to assail Accuracy of Death for its lack of coherent development or believability, it would be very, very easy.